Applications module Create edit field / Continue to "Final settings"
This dialog is shown when you create a new edit field. A static text element will be created next to the new element; this will automatically take the name of the new element. When you click on "Finish", the properties dialog of the new element will open. This option can be selected when creating an edit field with the control type "date", "time" or "date & time". 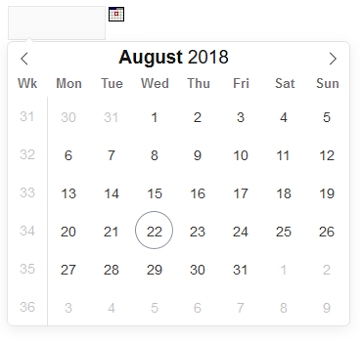 A date picker button, which opens a small calendar where a date can be selected, will be added to the workspace to the right of the edit field. The date selected here will be automatically entered in the edit field. 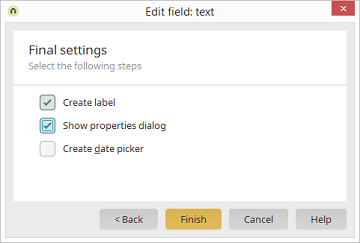 The date picker can be added later to existing edit fields by selecting Edit menu / Create date picker. On mobile devices, a corresponding date picker, which is shown when the user touches the edit field, will be generated automatically.